More importantly, my kid needs a bike. We’re getting ready to move to a very bikable town, and I failed as a parent by letting her go too long before learning how to ride. She’s getting the hang of it now, on a bike we bought at a big-box store a few years ago. It’s now too small and falling apart, despite the fact that it’s barely been ridden. But the idea of buying one bike is daunting, let alone two. I don’t know anything about bicycles, except how to ride one. (Assuming the adage is true, that one never forgets how to ride elephants and bicycles...that's how it goes, right?) And when we do have the bikes, will we actually ride them, or will they ultimately end up collecting dust in our basement? So my hope is to find our bikes at nearby estate sales. With a little patience, I’m sure I’ll come across a couple that will suit our needs: something inexpensive and not lame. And when it comes to my kid's bike, there might be a color preference we have to abide, but all in all my demands are few, and could probably be amped up a bit, frankly. I spoke to John Dodd, the owner of CycleWerx, a long-standing bike shop in Cape Girardeau, MO, specializing in both new and used bicycles. 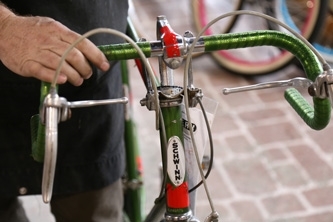 He gave us some insight on what to look for when checking out a bike at an estate sale, so we can be confident that we’re not buying more than we bargained for when it comes to repairs. Price is probably the most common reason for purchasing an estate sale bike, but there are certainly other factors to consider. Some people prefer the steel frames of older bikes, rather than the metals newer bikes tend to be made from (aluminum, carbon fiber, etc.). And of course there’s always the possibility of finding a vintage bike of considerable value—perhaps even something not priced that way. “Some people just don’t know what they have,” Dodd said. But newer bikes are constructed differently, intended to fit the rider better. “We pay a lot more attention to body position now,” Dodd said. And it’s a matter of personal preference, which build a rider chooses. But sometimes a lower price is enough of an incentive, construction be darned. It certainly is for me. 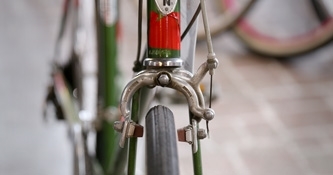 And, Dodd points out, you can outfit an older bike with newer components, in order to make it more comfortable. The first thing you should determine is how much you want to spend on a functioning bike, to make sure when all is said and done, you’re still within budget. Because from repairs to upgrades, it’s possible to nickel-and-dime yourself into paying far more than you intended on a used bike, Dodd said. Then, you should examine your bike to get an idea of how much you’ll need to spend on repairs (and if you’re buying a used bike, there are likely to be a few). “The first thing I would look at is the tires,” Dodd said. Look for dry rot, which appears as cracks in the rubber. It doesn’t mean an immediate death sentence—the dry rot on the tire shown is relatively minor, for example—but it will reduce the life of your tires, and you should plan on replacing them sooner rather than later. An average set of tires are liable to cost you $30-40 for a pair. Next, move onto the wheels themselves. Spin them to confirm that they are “true.” Listen for rattling. Check for wobbling. A little wobble likely won’t hurt. “If it’s rolling through the brakes, it’s probably okay,” Dodd said. But if the wheel hits the brake, it needs truing. Spin the wheels forwards and backward, watching for anything out of the ordinary. If the chain slacks excessively or otherwise detaches from the chain drive, then there’s a problem. The bearings are particularly important, as an excessive amount of looseness in the bearings is any part of the bike could indicate it was treated poorly in its first life. “If I’m wiggling all these things and everything’s loose, that’s should raise a flag that whoever rode this didn’t take care of it,” Dodd said, and unless there was something special about the bike, he would suggest moving on. 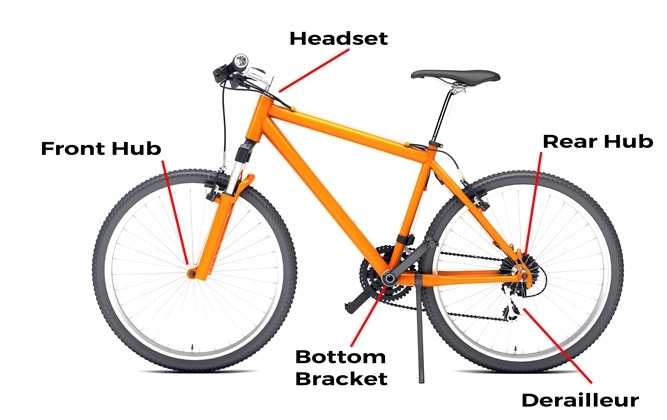 The headset bearings allow the handlebars to turn. “Grab the brake and wiggle it,” Dodd said. If there’s a lot of play, they may need adjustment. This is the case for all the bearings. 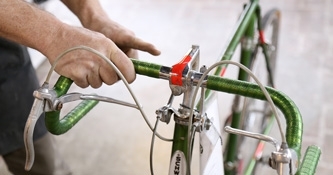 Pay attention to how the components move—if they wiggle or seem unstable, know that adjustment may be needed. The bearings in the wheel hubs allow them to spin on their axles. 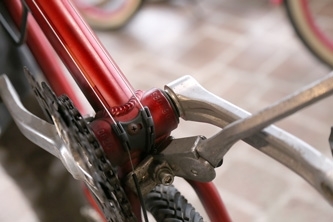 The bearings in the bottom bracket connect the two pedal cranks together and allow the crankset to rotate freely. 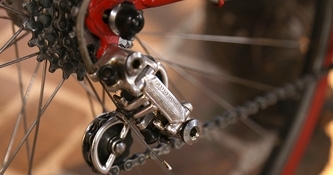 The bearings in the two rear derailleur pulleys help move the chain between rear sprockets. He also suggested simply lifting the bike up and shaking it. A well-tuned bike won’t rattle and clank. Next, check the cables. Watch for smooth operation and connection between the components. (When you move a shifter cable, does it move the derailleur?) “See, this cable needs to be lubed because I can pull it, and it doesn’t come back,” he said, pressing and releasing a brake. Recabling the bike is roughly $60. Attention must also be paid to the brake pads, which could be worn down due to use, or could be old, dry, and brittle due to disuse. “You want to make sure there’s plenty of material there, and they look basically square and normal,” Dodd said. That will tell you whether there is a decent amount of pad left. But it will take a keener eye to determine if they are dry. It’s not a bad idea, on a used bike, to go ahead and replace the pads. “It will just stop better,” he said. When determining a bike’s value, a simple internet search can be helpful, particularly to the novice. Find the serial number on the bottom bracket (usually), and go online to find out the year the bike was manufactured, and get an idea of how much it’s worth. Because not all bikes are created equal. 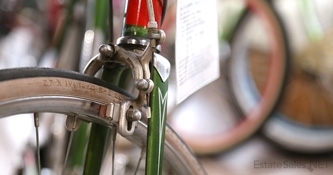 A bike originally purchased in a department store is not going to be the same quality as one sold at a specialty store. And it’s difficult to go by brand, because some that were once well-regarded are no longer producing the same high-quality product. And, of course, if you have the opportunity to ride the bike before buying it, that would be best. But it’s not always an option. But with a little know-how, you can help ensure that the bike you buy will be one you can ride for years. Or put in your garage with the intention of riding it for years. But this time, you’ll ride it. I believe in you. I believe in us.